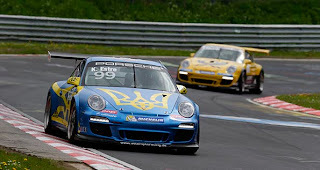 Another day, another great Nürburgring video, must be that time of year!. 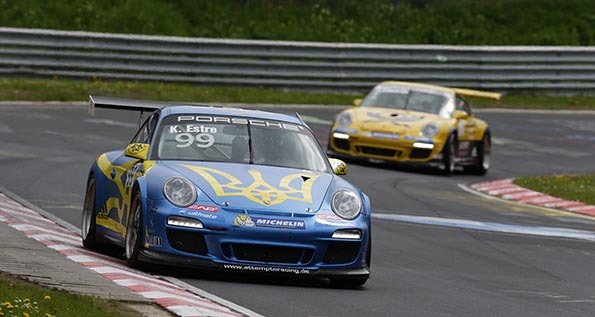 The clip up top is an intro to the main event below: our old friend, Frenchman Kevin Estre chasing Brit Sean Edwards in the third round of the 2013 German Carrera Cup. Sit back, turn the volume up and enjoy every bump and curb hit as the two barrel though the Nordschleifle. What a great spot for a camera, there's not much between the two until Edwards makes a small mistake at Brünnchen. Don't feel too bad for Sean though, after the Carrera Cup race he hopped into the Black Falcon SLS AMG which took the overall win in the 24h race!